Eighteenth-century Venice was dominated by the Tiepolo family of artists. Venice had lost influence as an artistic center since the sixteenth-century, the era of Titian and Veronese. Exciting new artists such as Caravaggio and the Carracci brothers were working primarily in central Italy, Rome in particular. By adopting the tradition of grand, allegorical ceiling painting for the aristocratic elite, the father-son team of Giambattista and Domenico Tiepolo brought Venice once again into the center of artistic life. The Tiepolo family also helped define many of the qualities we think of as Rococo. 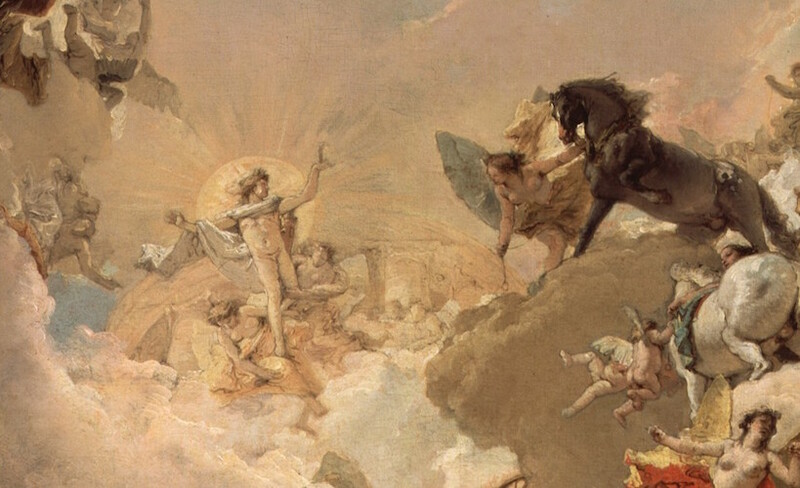 What most people notice first about Tiepolo paintings are the colors. Pastels in complimentary schemes lend a soft, often romantic quality to otherwise active scenes. The use of dramatic poses and simultaneous narrative are reinforced by the tension inherent in the color schemes, keeping the pictures lively and engaging. This combination of precision, apparent ease, and liveliness was referred to as sprezzatura, and the Tiepolo family came to define it as an artistic trait. Between 1750 and 1753 Domenico and his father lived and worked in Würzburg, Germany. 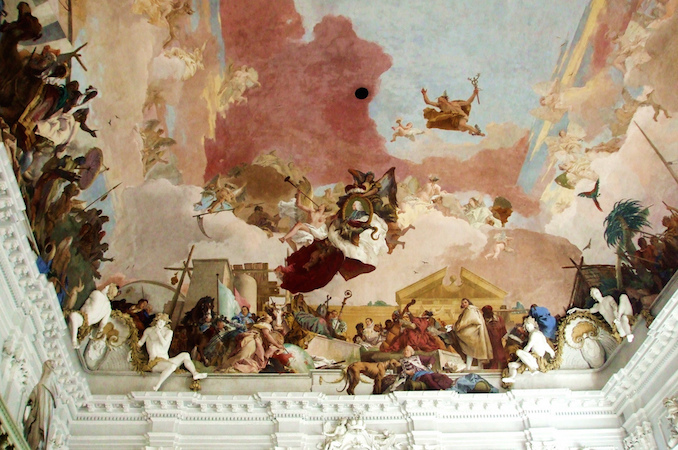 Giambattista Tiepolo had been commissioned to decorate certain areas of the Residenz, or royal residence, and he brought Domenico along to assist him with this work. The frescoes they produced are generally considered to be the greatest masterpieces of the Tiepolo family workshop. The two artists worked so well together that it is in fact impossible to differentiate exactly which passages were painted by which artist. 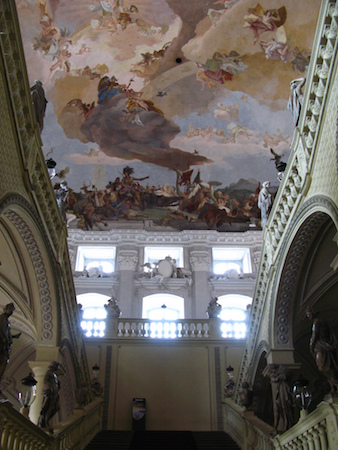 The ceiling above the grand staircase of the Residenz contains an allegorical depiction of Apollo presiding over the planets and continents. At each edge of the curved ceiling, just above each wall, are symbolic representations of Europe, Asia, Africa and America. Giambattista and Domenico designed each section to be viewed from specific “stopping points” specified by the patron. Here visitors climbing the staircase could pause to admire the work, and appreciate how the perspective of the fresco seemed to adjust to their position in the room. This imaginative use of perspective helps the allegorical image come alive for viewers, but can make this three-dimensional painting look awkward in two-dimensional photographs. The Tiepolo family also explored new media and artistic subjects, particularly Domenico. 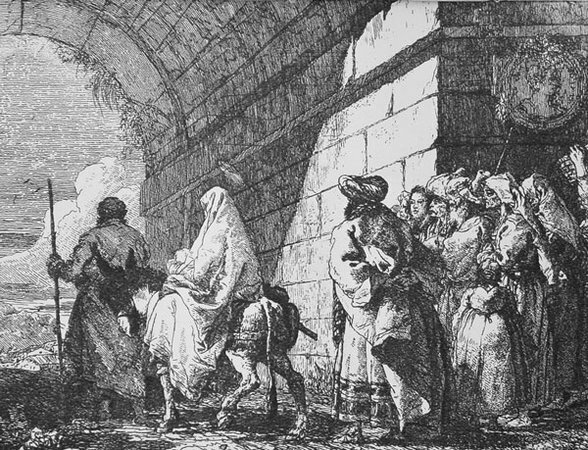 In 1753 he published a series of twenty-four etchings titled Picturesque Ideas on the Flight into Egypt which were executed during the breaks in activity at the Residenz. These sheets were produced in a cinematic way, much like modern storyboards. The story unfolds page by page, and the viewer is brought into the scenes through the way the images are composed. In the fourth image, we see the backs of the onlookers at the right side of the composition as the holy family departs on their journey. The architectural framing of the image encourages the viewer to imagine being one of the citizens of Jerusalem, witnessing the departure of Mary, Joseph, and their newly born son. The strong diagonals that make up most of the image enhance the sense of movement, and help to place the viewer in relation to the image’s protagonists. Despite Domenico’s attempts to bring his family’s artistic practice into the age of Enlightenment, the Tiepolo style was viewed as passé before 1800. After Austrian troops annexed Venice under direction from Napoleon in 1796, Domenico retired to his country villa, and the Venetian painting tradition, like the republic itself, came to an end. Cite this page as: Jeremy Miller, "The Tiepolo Family," in Smarthistory, January 7, 2016, accessed April 22, 2019, https://smarthistory.org/the-tiepolo-family/.